In St. Petersburg there is a beautiful and amazing street which is called Zhodchego Rossi, where two completely identical buildings of yellow color, reflected as in a mirror are standing opposite to each other. Zhodchego Rossi Street stretches from Alexandrinsky Theater to the Lomonosov Square. Its uniqueness lies in the fact that the building is executed in exact accordance with the ancient canons - the height of buildings is equal to the width of the street and is 22 meters and its length is exactly ten times more - 220 meters. In the middle of the 18th century in this place of St. Petersburg there were courtyards and gardens of the Anichkov Palace and Palace of the Vorontsov Count. In 1810, architect Carl Ivanovich Rossi was engaged in the redevelopment of this territory, and then he intended to create a single space between the Alexandrinskaya Square and Radishchev Square so it was called the Lomonosov Square. In 1828, Emperor Nicholas I approved the creation of an architectural ensemble comprising two buildings of 220 meters length, which are a mirror image of each other. The entire architectural ensemble was completed by 1834. On November 27, 1832, the street was given the name of the New Theatrical due to the decree of Nicholas I, because Alexandrinsky theater had just been built, from which the street began. On October 6, 1923, it received a modern name in honor of its creator. Under a single facade on the odd side there are numbers 1 and 3, on the even - number 2, 4 and 6. House № 2 was built as a profitable house and in 1832 in the newspaper "Northern Bee" was published an announcement about the lease of apartments and shops in it.Onthe second and third floors were the living rooms and the first floors of the buildings were represented by galleries and stores and shops with goods of the glass, paper and porcelain factories were located on the first Soon the merchants of the Hospitable Yard turned to Nicholas I with a request to protect them from competition and in 1835 the emperor decided to place a ballet school in the building.According to the project of architect A.K.Kawasha arches of the first floors on both sides of the street were laid, the arches were remade into the windows, and in 1836 the Imperial Theater School was placed here, Anna Pavlova and Mikhail Fokin, Agrippina Vaganova and many other talented artists have graduated that school. 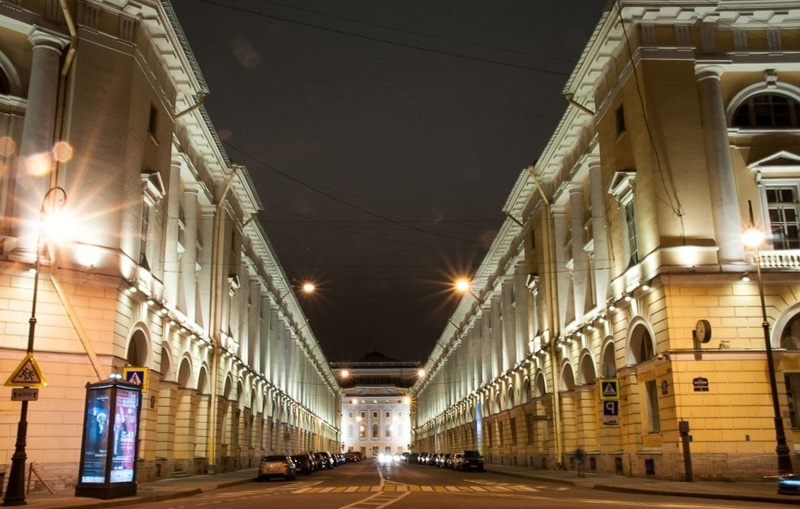 According to the project of the great architect, the ensemble included an ideal in proportion the street with two buildings, starting from the Alexandrinsky Theater and ending at Radishchev Square, which egresses to the Fontanka embankment. In contrast to the magnificent and majestic appearance of the Alexandrinsky Theater, the facades of the two three-storied buildings look more modest. Through its extension they are decorated with white dual semicolons of the Doric order, between which are large windows with a semicircular top and a relief ornament. In the part of the house № 2 which adjacent to the Square of Ostrovsky, where until 1917 the Directorate of the Imperial theaters was located, the Museum of theatrical and musical art is currently located as well as the St. Petersburg Theater Library - a unique collection of books and documents on theatrical art. In the middle part of the building is the Music Library of Mariinsky Theatre. In the part of the building adjoining to the Lomonosov square, there is the Holy Trinity temple.Being founded in 1806, it was the home church of the Theater School and the Directorate of theaters.The temple was restored in 1998 and now it can be visited, passing through the Academy of Russian Ballet named after A.Y.Vaganova. According to the number of houses, the street Zhodchego Rossi is the shortest in the northern capital, there are two buildings (five houses № 1, 3 and 5 on the one side and № 2 and 4 on the other).And the shortest street in length in the Northern capital is Small Garden, its length - 179 meters. Many of the streets, which received names at that time, had defining definitions: the Lane of the Zhodchego Quarenghi and the Tchaikovsky Composer Street, the Writer Griboedov Channel and the Rostrelli's Zhodchego Road.Over time, clarifying definitions have been lost and only the street Zhodchego Rossi has retained its original name. When it is raining in the northern capital, the two twin houses are reflected in the puddles and we already see four identical houses - an amazing picture! In 1941-1945, the staff of the Leningrad Military District was located in the house №2, for which a concrete bunker was built in the middle of the building. In 1998, for the first time in the city there were installed automatic machines for parking payment. In the basement of the house № 1/3, opposite the ballet school named after A. Vaganova, the night club of Rossi's Club is located with a restaurant, dance floor and karaoke at the present time.